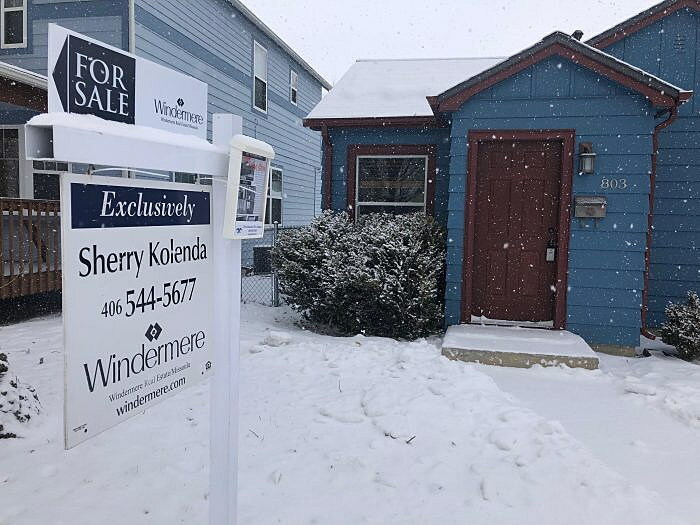 The median price for a single-family home in Missoula increased by 75 percent between 2002 and 2017. And retired real estate agent Collin Bangs believes if the city and county don’t find ways to create affordable housing, that price will continue to increase. “It can be done, I’m sure, but I’m afraid if we don’t get really inventive and pull together, it won’t get done and we’ll have a large portion of our population who will never have the opportunity to buy a house. To me, that would be really bad,” he said. At a City Club Missoula forum on Monday, housing experts talked about ways to help fund the construction and rehabilitation of affordable housing – ideas that will be included in the city’s housing policy, due for release next month. Homeword executive director Andrea Davis explained that housing is affordable if 30 percent of a person’s income goes toward rent and utilities. A worker paid minimum wage full-time can usually afford a total of $450 in monthly rent and utilities. However, the average two-bedroom rental in Missoula is $925 per month, not including utilities. That’s a big gap in a city where 50 percent of the residents are renters. “I don’t think I have to describe the fact that we have a challenge in Missoula, and the greater state of Montana, with people living and working here being able to afford their home and the other aspects of their life,” she said. Buying a home is another issue, Davis said. Over the last 24 years, Homeword has built or rehabilitated almost 900 affordable homes around state. Recently, the organization purchased six homes that will be available for purchase at 80 percent of the area median income, which is equivalent to a $15 per hour job. Four of the homes are still available for purchase, and are located north of the Missoula Food Bank. They are made affordable through community land trusts with organizations like Homeword, since the land and homes are no longer in the speculative market. Tyson O’Connell, a project developer with Wishrock Housing Partners and Investment Group,demonstrated ways the company has used tax credits and other funding to create affordable housing units across the country. A project in New Mexico looked at preserving units and maintaining their affordable status for 30 to 40 years. Federal resources like the Housing Assistance Payment Contract, or Section 8, help maintain that status, along with low-income tax credits. The units will stay affordable for another 45 years, O’Connell said. Tax increment financing, or TIF, also can be used as a tool to make affordable housing projects happen. The process subsidizes companies by diverting or refunding a portion of their taxes to finance projects like infrastructure improvements and building units. Missoula has TIF districts where this process can be used, such as in the city’s midtown corridor. Wishrock Housing Partners wants to do more work in Montana, but the state has a lack of affordable housing resources. A project the company undertook in Nebraska used 11 sources of funding, including grants, TIF funding, state and federal low-income housing tax credits and others. “The resources in Montana are just dismal compared to other places,” O’Connell said. O’Connell said the Missoula Housing Coalition is pushing two bills through the Legislature right now to help fund projects. House Bill 16 would use coal tax trust fund money to provide $15 million in loans to develop low- to moderate-income housing, while Senate Bill 18 pushes for workforce housing tax credits. It would use federal and state money to build workforce housing, something Montana desperately needs. “There’s an opportunity for our local government to incentivize and to look at the regulatory environment and say, what is a good blend to incentivize more development that is affordable to Montanans?” Davis said. Retired real estate agent Bangs warned, though, that affordability and median home prices will continue to increase in the years to come if change doesn’t happen. Still, Bangs said he has hope.